Includes drive roll, non-metallic cable liner, and contact tips (qty. 6) for feeding .035 (0.9mm) aluminum MIG wire. Also includes 1 lb. 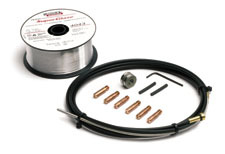 spool of SuperGlaze 4043 aluminum MIG wire.